Recently, I’ve been up in the mountains. The Pacific Northwest weather has turned; it has started raining, and a chill has settled in the air. People have cranked up their heaters, are lingering inside more and more, and the dark drifts in early. Total insulation, isolation, however, is impossible, though we often do not feel it, hiding away as we often do. I’ve been raring for adventures. Almost every weekend spent at home with chores seems like a weekend lost. 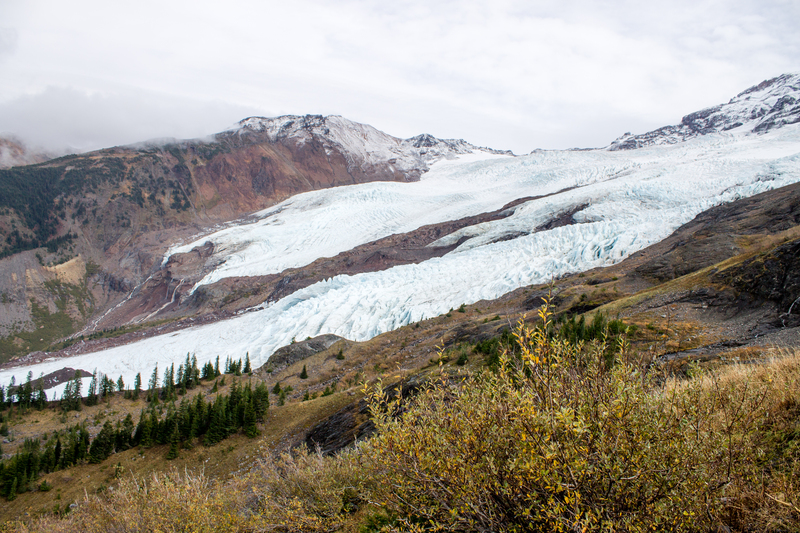 Ben found a hike, Heliotrope Ridge, that sounded like an especial, beautiful adventure: fording several water to come up to a glacier at Mount Baker. So we made our way, hoping across several rivers and gradually gaining altitude, until we hit our last obstacle. A not huge but not small torrent rushed off glaciers above and flew downhill, over drop offs, rocks, and blocking our way. You see, I have short legs: hopping across was not an option. I peeled off my shoes and socks and plunged my feet into the water in the hopes of wading across before realizing that was futile. The water instantly sapped away my feeling, the rocks were slippery, the water was pushy, and there was nothing to hold on to. Falling in the frigid river and soaking myself was a dangerous prospect; I looked up as distant foggy masses slowly drifted in. Still barefooted, with my shoes in Ben’s care across the river, I scrambled higher and higher up the bank. Loose, rocky soil ran away from my fingertips as I tried to cling on, all of my muscles clenched. I scouted higher and higher. Ben, with some difficulty, re-forded the river and joined me in my attempts to scout out a way across. 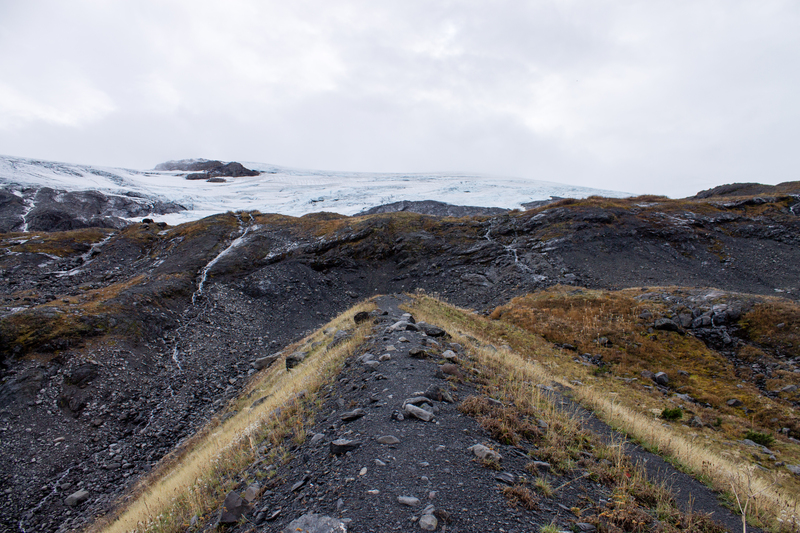 There was no way for us, so we settled for ascending a climbers’ trail, high enough so we could see the glacier over the river. We settled down in our down jackets to eat a snack of cheese and crackers. Leaning over the river, poking my foot in and realizing the water’s strength and withdrawing, I felt a buzzing, raw fright. I had reached a natural limit. My situation was far from dangerous, but, pushing, I could have made it so. My body realized that, and whatever fear chemicals there are pulsed mildly under my skin, and I heeded them. When I was in Peru, trekking to Lares with friends, using a hand-drawn map as our guide, I felt a similar buzz, a knowledge that the situation could easily be beyond my powers. Jim and I stood on a cliff, supposedly overlooking a town through which the road we need to reach passed through. We could not see this town, though – everything below was completely obscured by fog. Darkness would be descending, and we had a couple hours yet to walk. We could not see our way down. We walked along the cliff, Jim scouting ahead of me, climbing down potential routes that quickly turned out pointless. We leaped across a waterfall. Finally, we found the usual footpath down a steep hill: slippery but fairly safe. I still felt the alarm pulsing through me. We were at the mercy of the weather and the light. Already earlier that day, we crossed the first pass, the way ahead obscured by falling snow and drifting, heavy clouds. 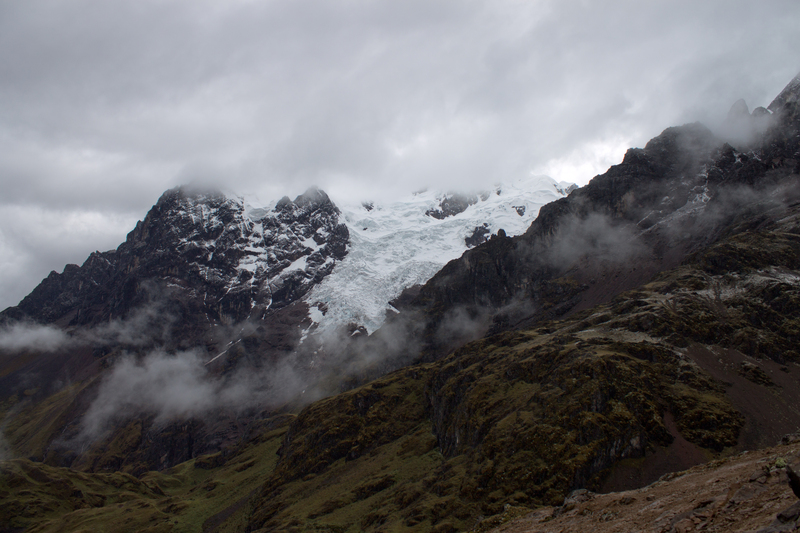 The ice-topped mountains surrounding us were awe-inspiring, and ominous. We made it to Lares that night, tired, chilly, and wet, but proud of our hike, and the two passes we’d climbed and descended through in one day. This trepidation is not fear alone: it is paired with a healthy awe, with admiration, appreciation. Ben and I drove out to the gorgeous Methow Valley a few weekends ago, going through Washington Pass. Our way home in particular was snowy. Despite plows prowling back and forth, snow was accumulating rapidly, making the road white and slick. 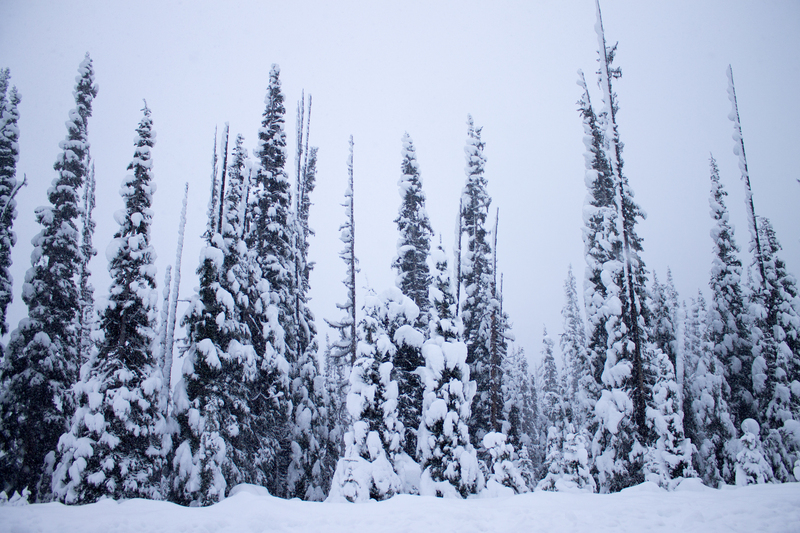 The trees bent under the weight of heavy, wet flakes. Several times we pulled over to the side and ran around gleefully. Snow! Mountain! Beauty! It was gorgeous, and it was indifferent to us. The snow fell, making the landscape pretty, and ever more treacherous. That’s when I feel the blood pulsing through my veins. We humans never seem to remember it, but the earth can push us aside. We like to hide ourselves indoors, furthering the illusion of protection – a protection that could, really could, be shattered. We also spew and tear around, plundering, polluting, not really thinking beyond ourselves. Our work may last for a while, but mess around with the earth, and it can really, really slap us down. Step outside and remember: the world is more powerful than we ever will be. Best to take care. The mountains of the Pacific North West can be truly awe inspiring. Great job depicting that. Yes, it’s too easy to stay hibernate when the weather turns wild, sometimes it’s good to step outside. It’s all a matter of respect for the elements and taking care, as you said. Exactly. Glad you feel the same, and thanks for reading! Amazing mountains of the North west and a nice post. This gave me goosebumps. Beautiful photos and wriiting. I love the mountains. But I also have respect for them. Great story Leah, and I love you pictures! I love how your just getting out there and really enjoying life. It’s just so inspiring. Thank you! Trying my best. These photos were taken only a few hours away from my home, actually. Backpacking around can be surprisingly cheap if you do it right – but I’m not doing that myself at the moment, since I work full-time. I’m always dreaming of more traveling, too.